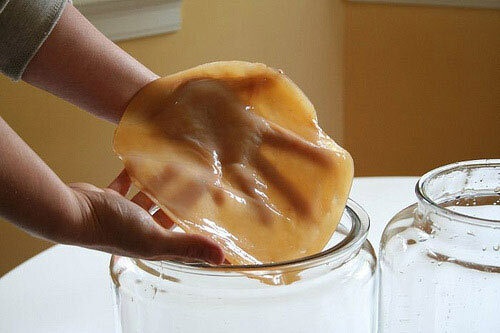 1 How to grow the Kombucha? In some homes, the kitchen can be found jars, where tea, brownish solution amazing floats "tea jellyfish", otherwise "Kombucha". In the process of their life, layered yellowish white "jellyfish" tea solution of ferments gradually. Infusion, obtained from a similar fermentation, very useful, in a special delicious, lightly carbonated. What kind of a body, which prepares us such an amazing drink? botanists say, that tea "jellyfish" or "mushroom" - is nothing more than, how meduzomitset, people used to cook a delicious drink. This mucous layered film formed on the surface of the liquid and is a yeast colony, acetic gluconic bacteria fermentation. Interesting body consists of a large number of films, which are laminated on each other as fungal growth. Imported to Russia, he was at the beginning of 20 Century Japan, so it is also called Manchu or Japanese mushroom. How to grow the Kombucha? 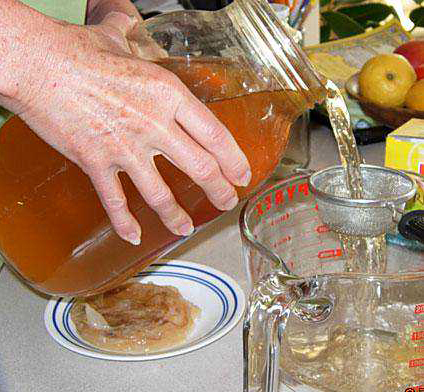 For, to grow the Kombucha from scratch, you must buy it (often classified ads tea fungus can be found on the Internet), or to find with friends, gently separate one of its layers on end, and wash, then placed in a clean jar, which is poured a new solution for the young "tea fungus" power. Some experts suggest initially place the mushroom a day and a half just warm boiled water, for his acclimatization, and only then replace the water sweetened tea solution. If the fungus is small in diameter, vessel may also be of small size, and the liquid should be slightly, from 0,5 l. For some time the young mushroom is lying on the bottom, then gradually rise by up banks. Healthy fungus will hereinafter be above, and if his illness or death, will sink to the bottom. The growth vessel increase, as the amount of fluid. As a home for adult "Medusa" suitable vessel 2, 3-liters with a wide neck, ceramic or glass. It must be clean, do not have extraneous odors. First of all, Prepare fresh tea leaves of tea. Tea take granular or sheet, It can be inexpensive, without any aromatic or fruit additives. You can even take a fresh tea leaves asleep, its bay again with boiling water. For one liter of boiled and cooled water at room temperature take 120 g granulated sugar, add a little present,, cooled and filtered brewing, that the color of the solution was slightly brown. Liquid mix thoroughly, until the sugar is completely dissolved. Then, This solution was put into a pre-prepared film "tea fungus". the temperature in the room need to be somewhat higher than for the initial growth +25aboutWITH, adult mushroom sufficiently +18-20 aboutWITH. Before use, be sure to drink it filtered. Having in-house useful Kombucha, All year round you can drink natural, tasty and healthy drink, which will save money and health of the purchase of synthetic substitutes for their thirst.